How are things with the Cane Toads in Australia these days, I wonder? When Patricia and I travelled around Oz on buses, back in 1990, one of my oddest ambitions was to see a real live Cane Toad. Odd, I know, but I’m an odd fella. Actually, there was a good reason for my strange infatuation. There had been this great documentary film in 1988 called ‘Cane Toads – An Unnatural History’ and I had really liked it. You should try and see it if you ever get a chance. Although it documented the introduction of Hawaiian Cane Toads to Australia in 1935 and their subsequent rise as a super pest, the film was actually much more about the wonderful local people who had to contend with the dreaded toads on a day to day basis. So, yes, I wanted to see a Cane Toad and as the bus eased across the border of the Northern Territory and into Queensland on the Barkly Highway, into Cane Toad Country, I sat into the jump seat beside the driver and asked what my chances were of seeing a real live Cane Toad. He looked at me in much the same way that the bus driver from Perth to Melbourne had done when I asked him about Kangaroos. Yes, he reckoned I might see one all right. Our first bus journey had been the Perth/Melbourne one and it had taken 47 straight hours. The journey, stopping only for sandwiches and wees, was the equivalent of bussing from London to Moscow. I liked to sit up with the driver through part of the night as we thundered across the Nullabor Plain toward Kalgoorlie, where Skylab fell down. “Will we see a kangaroo?” I asked and he looked at me for the idiot I undoubtedly was. There were many Kangaroos on that midnight drive across the wastelands. Huge manic-looking hitchhikers, poised at the edge of the road, who were as likely as not to jump straight into the headlights of the bus. I was the last thing seen by some of the first kangaroos I ever met. The look was similar from the Queensland bus driver. He reckoned, in the weary, reserved manner of bus drivers the world over, that my chances of seeing a Cane Toad were high. We stopped at a gas station and I asked the lady on the forecourt if there were any Cane Toads about. He answer was memorable. “I had one in the toilet less than an hour ago.” She explained how they liked to seek out water and that it was always wise to have a peer into the bowl before you sat down, just in case one was wallowing down there. That was great, but still no Cane Toad. 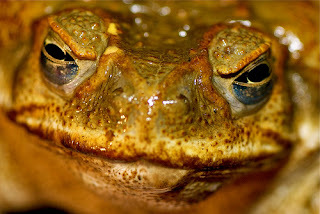 If I was just telling a story, I would now make my main Cane Toad moment as the first time I saw one, that would work best for the story and, indeed, I would normally do that, having all the liar qualities that a story teller needs. Alas it doesn’t work for the timeline or the geography of our journey and I am aware that some of my Australian buddies might read this and know immediately that I was talking shite. So I’ll just play it straight and admit that I saw lots of Cane Toads over the next few days. They weren’t hard to find. There was even an odd thing where stuffed cane toads were sold as souvenirs. They were inevitably posed in ludicrous ways such as playing the guitar or drinking a tiny can of Fosters. I didn’t like them. I liked the Cane Toads for their anarchic uselessness and didn’t want to see them corralled into some semi-useful role. So my diary tells me it was at Mission Beach that I had my definitive Cane Toad moment. I don’t often keep a diary (apart from this blog) but I kept copious notes of our journey around the entirety of Australia on the buses and it is a document I value quite highly. It’s open on the desk in front of me now and it’s better than any photo album because I made every line of those memories myself. It’s been fun writing this blog post, revisiting the words I wrote twenty two years ago and plotting the journey again on Google Maps. I looked at some of the places we went, using Streetview and that’s an amazing memory trip too. So, according to this diary of mine, we arrived at Scotty’s Beach House on Mission Beach on Tuesday 16th October 1990. In sitting down to write this thing, I had forgotten how sick Trish had been there for three days. I had forgotten the joy of watching Mad Max on video with the original Australian accents, I had forgotten the wild truth-or-dare sessions by the pool which I watched nervously over my book. But I hadn’t forgotten the Cane Toads. On that first evening I was standing looking out the window over a wide sprinkled lawn to the back to the hostel. Scotty himself came up and stood with me. “Alright mate?” he said. Scotty laughed. He pointed to a corner of the lawn where there was a little single spotlight shining on his ‘Beach House’ sign. “Watch.” Sure enough, as I watched the space under the light, I began to notice that the grass was twitching. Dark lumps were mooching around in the leafy shadows beneath the sign. Scotty leaned over to the wall beside him and flicked a switch. “They’re not,” he said, as the entire garden leapt alive with floodlighting. There were Cane Toads everywhere. They weren’t just in the light, that was just where I could see them. They were everywhere. Hundreds upon hundreds of them. I went out and walked on the lawn in the renewed darkness and it seemed that every footfall was pre-empted by a squelchy evacuation of the area by another lumbering toad. It was the stuff that memories are made of. As I write, I’m enjoying reading the diary so much that I want to leave you with a random extract from it, written on Friday 19th October 1990 on Magnetic Island. There's another story from the Australian diary here and there's some slightly different diary stuff here, if you're interested. I have never seen a cane toad but I used to live down the road from a frog pond to which we made regular pilgrimages during my childhood to acquire tadpoles which we then allowed to die in jam jars on our windowsills stupid buggers that we all were. I’ve told this story before—perhaps even to you—but I’ll tell it again. It’s about the last toad I saw which was in the back garden of the flat we’re in just now. As I’ve mentioned before a precondition of us taking this flat was that there would be no garden for me to do and although that is the case—our factor (or whatever he’s called) attends to the mowing of lawns and the general upkeep of the place—I still have to go out the back periodically to deposit our back bags in the wheelie bin or in someone else’s wheelie bin when one of our neighbours has filled up ours. Anyway this day I went out there and saw this humongous toad and the pure joy I felt was wonderful. I don’t smile much but I picked him up and dashed upstairs to show him off to my wife who, to her credit, shared in my delight. She said I couldn't keep him though and so I took him to the burn that runs are the top of our street and let him go there. I do, however, have a similar experience to the one you had with toads. Across the road from the frog pond there was a river which I often wandered up and down when I was kid. It led to the sand quarry where we often played. This particular day I was on my own strolling back home when I realised that I was surrounded on all sides by slugs. You know the ones, the huge, sticky, black ones. There were hundreds upon hundreds of them all around me. I’ve never seen anything like it before or since. It was like something out of a horror film. And there was one called Slugs which came out in 1988 but I’ve never seen it. If, like me, you were hugely impressed by Watchmen you might be interested to note that finally—and much to the annoyance of Alan Moore ("Completely shameless" is what he actually said)—there is a new series of prequels which DC has just started releasing called Before Watchmen. You can read about it here. I’m not sure. I love The Dark Knight Returns and was desperate to read The Dark Knight Strikes Again when it came out—I didn’t even wait for the trade paperback, I bought the three issues as they were released—but it wasn’t quite the same. Moore had nothing—and is having nothing—to do with Before Watchmen but that might not be a bad thing. I wouldn’t buy them all but I love Rorschach. I would buy his series just for the covers. I don' think you told me that before, Jim. I love the delight of bringing the toad home to show him off... and then the delight being shared. I'd say there's a lovely poem in it, the unlikely demonstration of like-mindedness. I started to watch the much-reviled Watchmen movie and was quite liking it but then I fell asleep. I'll give it another go when it reappears on Film4. I have seen the film, Ken. I even own a copy. As you will likely have heard it is a ridiculously faithful adaptation right up until the ending which is surprisingly improved. And, the ending aside, that is the problem. It’s like having the book read to you. It has to be faced: although there can be some overlap in styles—more and more novels these days read like novelisations of film scripts—films are not books. They tell their stories differently and each have pluses and minuses. That said I felt much the same when I saw Gus Van Sant’s frame by frame (or so it felt) reanimation of Hitchcock’s Psycho. How could you take a masterpiece and copy it so lovingly and it feel like the walking dead? Aliens vs. Predator: Requiem ran into similar problems: it was produced by out and out fans and it should have worked but it was dire. So perhaps the problem isn’t so much that Watchmen was a bad adaptation but that it was adapted by the wrong people.